The Mini Trackball Keyboard from Adesso is a compact keyboard with an integrated optical trackball. 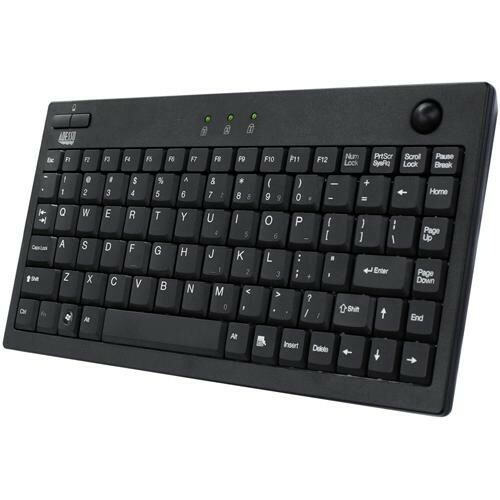 An all-in-one solution for pointing and typing, the USB keyboard can save a lot of space on your desk when you compare it with a full-size keyboard and mouse. The optical trackball is precise and delivers a very smooth tracking motion, with very little cleaning required thanks to its optical design. Perfect for spaces where space is a premium, the 87-key keyboard is compatible with Windows systems. Box Dimensions (LxWxH) 12.4 x 8.0 x 1.2"